Discussion in 'Member's "BackYardHerds" Journals' started by Shaman Squirrel, Sep 27, 2017. I am in northeast Texas. It gets so hot in TX, I long for winter. I am a single man, the sole human inhabitant of my single wide mobile home. I share it with chinchillas, ferrets, rabbits, a dog, and a prairie dog. 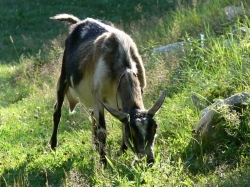 I live on 10 rented acres, but my goats are confined to a suitably-sized backyard. My place is just outside of town in a rural area. I'm a novice goat owner who has had them for less than 4 years. I grow trees that I ordered from the Arbor Day Foundation. I have a couple young pecan trees, and one of them is currently growing one pecan. Hopefully I'll have more pecans next year! In my spare time with the necessary resources, I would expand and get more animals. I'd like to get pigs, llamas, and a pony eventually. I never built a house or barn, but I did build a little shelter for my goats with the help of my neighbors. I've also fixed things on my own. I'd love to build if I had the resources. I've never welded, but am open to learning. My love for nature and animals have inspired me to have my little hobby farm. I've always wanted my own little "petting zoo" next to a private nature reserve, which is what I consider the property I'm on. I am very knowledgeable on mammal classification. I can tell you what order/family an animal belongs to. Did you know goats are in the same family as cows (but not in the same subfamily)? Being a member of Bovidae, goats are considered bovids, but they're not bovines. Did you know ferrets aren't rodents even though so many people assume they are? As members of the Carnivora order, they're distant cousins of dogs and cats, and they're in the Mustelidae family. I want to learn more about building structures; I'm really more of a brain than a brawn. I love wildlife, so I may have a problem with doing any kind of farming that requires pest control of native mammal species, even if they happen to be rodents. Certainly there will be those who disagree, but we can agree to disagree agreeably, right? I eventually want to provide my own food supply. I've grown tomatoes earlier in the spring and I milk the goats. These are skills that help me be self sufficient. Someday, I think it would be nice to live in the mountains in Montana and be self-sustaining. I can't drive, which tends to be a burden when living in the country. The more rural you are, the more you'll need your own transportation. Just have to look for some friendly neighbors that can offer lifts, especially when transporting large animals or farm supplies. I have built some cages for small animals, and I thought that would be a good hobby. However, I haven't found the time to keep going with that. As far as I know, Texas allows any kind of livestock. I currently only have goats. I don't fish, but I would use bait if I did. If I could create a college degree, it would be Wildlife Photography. I may be interested in herbal animal medicine if it is cheap and practical. All my cooking is done on a gas stove. I like to cook my own foods. I made cheese out of goats' milk but probably won't do that again until my goats kid in the spring. I would prefer that all my foods are as natural as possible. I always avoid artificial ingredients. My ideal super hero would be one who is environmentally friendly and can resolve conflicts between farmers and wildlife that actually benefit both. Most of my family loves animals, but are not country inclined like I am. My best animal experience was when I perfected the cheese recipe for goat milk. I can't think of what my worst animal experience was. I don't hunt. One thing I'd like to learn is what native plants are edible. I have foraged for blackberries. I don't currently raise any animals for meat. As a proponent of the environment, I would love to use alternative energy solutions such as wind or solar on my small farm, but don't currently have that. My experience with animals helped me learn responsibility. SA Farm, Donna R. Raybon, Baymule and 3 others like this. Greetings and welcome. Glad to have you with us. Maybe you can join one of the NE TX get-togethers we have every so often. Yes, that would be great. Where do you meet? And may I make suggestions for meeting places? We usually meet at one of our farms. It tends to be a pot luck affair. The guest list is pretty much open to anyone on Backyard Herds. However since you don't drive, if you have a neighbor or family member, who could drive you, they would be invited as well. The next get together is going to be at Latestarter's place. He lives near Mr. Pleasant. No date has been set yet. We usually meet at one of our homes. We take turns being the host for the event. Nothing fancy, just a good time with friends. Devonviolet and I met here on BYH, they were in the Dallas area, having moved from Pennsylvania to be closer to her daughter and family. They bought their farm about the same time we bought ours. We moved from Livingston to be closer to our daughter and family, so now we are baby sitters on call. LOL Latestarter moved from Colorado, we are all about an hour apart. It's fun to get together once in awhile, visit and enjoy each other's company. Sounds like a lot of fun! If my neighbors can't take me, I can use Uber. Wow! I don't think we have Uber out here in East Texas! I would think it could get expensive, if you travel out of your local area. So, perhaps there's a decent restaurant (<---spelling that always gives me fits So glad for spell check) near to you and we could all meet you there? You said you don't hunt or (currently?) raise animals for meat... So that begs the question... are you Vegan? or anti-meat eating? I ask simply because my get together was going to be for grilled meat... and I'm basically more of a carnivore than omnivore or herbivore... Nothing against those who prefer to not eat meat, but I can not be converted to that lifestyle. If meeting down your way would work better, pick a place and time and let us know and we can work out details. OR . . . if a family member or friend can't drive, maybe we could meet half way and one of us could pick him up, and one of us could take him home. I must confess our only vehicle is a truck with two seats, separated in the middle. Although, I believe there is a seat belt, for a middle passenger. So, if you don't mind sitting in the middle, we could be part of a carpool. There are a few places in Terrell that I might like. There is a park called Ben Gill and there are also quite a few restaurants. There's also my yard and you can meet my goats. I'm not a Vegan; I like to classify myself as a poultrytarian. I eat lots of chicken. I try to avoid pork and beef, but I may occasionally enjoy small amounts as pizza toppings, etc.